17 | February | 2010 | 0001 Awful Thing(s). Forget it!!! You just toss the sucker away. You figure that a simple tool as an umbrella would help in times of inclement weather such as heavy rain, light wind, and sunny afternoons yet they become more cumbersome that even Rhianna gets frustrated Yeah..Ehh..Ehh! 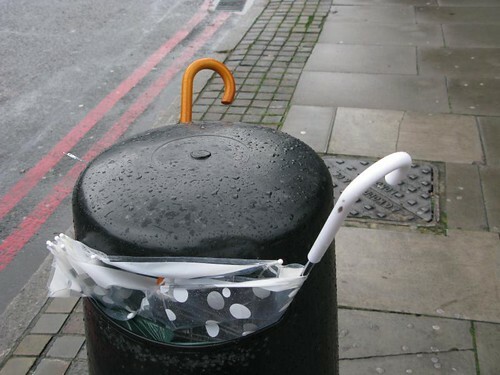 So after using your umbrella in one of these unfortunate weather induced events comes the part of putting away the object. Now most homes, offices, or restaurants aren’t equipped ready for umbrella stowaways so you must resort to laying it behind you on the bench seat or on a side chair at your table (if available). Closing the umbrella has been dubbed as one of the most silly processes since more than likely you close down the umbrella as it folds itself in but then sometimes doesn’t catch the “guard” clip and then opens back up! Then you repeat the process and then if you get successful you have to wrestle with the fabric material of the umbrella and wrap it back up! Then once you have accomplished that then the handle of the umbrella pops back out jabbing you in the stomach or hitting an unexpected friend/person next to you. Now how awfully uncoordinated is that? !